Fr. Annibale Bugnini, CM, was a priest of the Congregation of the Mission, an institution founded by St. Vincent de Paul (hence the epithet Vincentian) to preach the Gospel to the poor, as its motto, “evangelizare pauperibus” indicates. In 1947, a scandal arose in the residence where Bugnini and his co-worker, Fr. 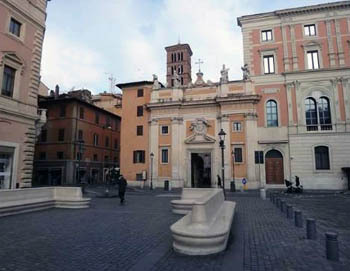 Francesco Bossarelli, CM, lived in Rome at the Church of San Silvestro al Quirinale, which belonged to the Congregation of the Mission. Records from the Vincentian archives show that in 1947 Bugnini, as Secretary (see here) of the Congregation’s Provincial Council, (1) was in charge of its administrative affairs when millions of dollars of Vatican funds went missing. A special Commission set up by Pius XII found that Fr. Francesco Bossarelli “and his associates” were guilty of embezzling $2,000,000 belonging to the Vatican in “black market financial dealings.” (2) (see here, pp. 49-50 and here, p. 2 - Shades of Sindona and the P2 Masonic Lodge). Inaugurated in Paris in 1943 on the private initiative of two Dominican priests (3) under the presidency of Fr. Lambert Beauduin, it was a magnet for all who considered themselves in the vanguard of the Liturgical Movement. It would play host to some of the most famous names who influenced the direction of Vatican II: Frs. Beauduin, Guardini, Congar, Chenu, Daniélou, Gy, von Balthasar, de Lubac, Boyer, Gelineau etc. But someone in the Roman Curia did know about the CPL – Msgr. Giovanni Battista Montini, the acting Secretary of State (6) and future Paul VI – who sent a telegram (see here, p. 3) to the CPL dated January 3, 1947. It purported to come from the Pope with an apostolic blessing. If, in Bugnini’s estimation, the Roman authorities were to be kept in the dark about the CPL so as not to compromise its activities, a mystery remains. Was the telegram issued under false pretences, or did Pius XII really know and approve of the CPL? What is certain is that Fr. Bugnini could not have been appointed as Secretary of the 1948 Commission without Msgr. Montini’s intervention with Pius XII, as it was the Secretary of State who, in the normal course of Vatican affairs, had the biggest say in forwarding names for papal appointments. His objective was to smash “the hegemony of the Congregation of Rites.” (8) Soon it would be reduced to a tin pot army incapable of defending the realm of the Church’s worship against his policy of “inculturation.” Then, it would be abolished by Paul VI in 1969. The reason for the secrecy was not hard to find: Fr. 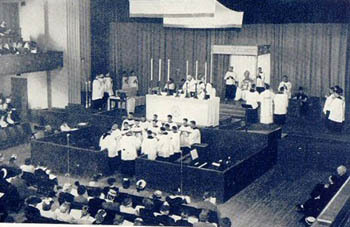 Bugnini’s agenda included liturgical deviations condemned by Pius XII in Mediator Dei, even though he could not introduce them all immediately. In the light of this collusion, the	Novus Ordo of 1969 was simply the end game of a decades-long strategy masterminded by Fr. Bugnini with Msgr. 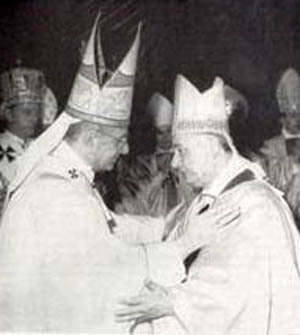 Montini acting as his personal consigliere and “Grand Vizier” to Pius XII. These ideas expressed in 1949 would form the foundational principles of Vatican II’s Sacrosanctum Concilium. For all practical purposes, the Roman Rite was dead in the water many years before it was officially buried by Paul VI. The special Commission insisted that the burden of repayment to the Holy See should fall on the entire Vincentian community around the world. To satisfy the Pontifical Commission, the Congregation’s Motherhouse in Paris asked the American Provinces to arrange for loans of the essential money because no other Provinces could raise the required funds in the aftermath of the war. It was not until 1966 that the debt was fully paid. Frs. P. Duployé and A-M. Roguet. Its mission was to promote the Liturgical Movement by organizing conferences, encouraging research and publishing liturgical studies in its magazine, La Maison-Dieu, which was produced by the Dominican publishing house, Editions du Cerf. In addition to the term Vincentians, priests of the Congregation of the Mission were sometimes called Lazarists after the Maison St. Lazare in Paris where St. Vincent de Paul had lived and worked. P. Duployé, Les origines du CPL, Mulhouse, Salvator, 1968, p. 308. Forty religious superiors and seminary rectors were assembled there under the chairmanship of Mgr. Harscouёt, Bishop of Chartres, a supporter of Beauduin since 1909. Among the speakers were Fr. Daniel Perrot, Rector of the Seminary of the Mission de France for worker-priests, Fr. Pie Régamey, OP, editor of the review L'Art Sacré who advocated a minimalist style of church decoration, Fr. 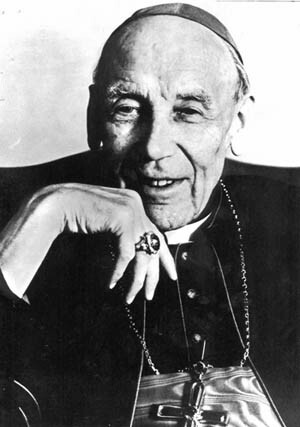 Yves Congar, OP, a progressivist theologian and pioneer of ecumenism, Fr. A-G Martimort, a convenor of CPL events and future drafter of Sacrosanctum Concilium, the above-mentioned Fr. Duployé, OP, and the ubiquitous Fr. Beauduin. After the death of the last Secretary of State in 1944, Pius XII did not appoint a successor, but gave Mgr. Montini the role of “Substitute” and later “Pro-Secretary of State.” This does not mean that Montini was a minor functionary; he was responsible for both the Church’s external relations with other countries and the internal relations among the various other offices of the Church. In his capacity, he had discretion as to who should see the Pope, what information reached him and which persons should be considered for appointment to Vatican posts. 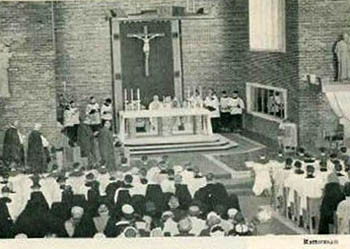 A. Bugnini, The Reform of the Liturgy 1948-75, Collegeville, Liturgical Press, 1990, p. 42. Apud Denis Crouan, The History and the Future of the Roman Liturgy, Ignatius Press, 2005, p. 136. In 1945, Pope Pius XII approved for use in the Divine Office a new Latin version of the Psalms, the work of a committee of experts at the Pontifical Biblical Institute in Rome under the direction of Fr. Bea, SJ. The committee made a complete break with tradition by discarding the biblical and liturgical Latin that had been used in the Church since early Christian times. In its place they used a form of Classical Latin borrowed from the humanistic tradition of the ancient Romans, which had a different connotation. Even its rhythm was unfit for Catholic purposes as it could not be easily sung to Gregorian Chant. This innovation introduced by Pius XII could not be regarded as an example of the “hermeneutic of continuity.” Rather we should call it the “Bea-tification” of the Psalter. Interestingly, Pope Paul VI perpetuated the same myth when he stated in his Apostolic Constitution Missale Romanum of April 3, 1969 that the Novus Ordo and the liturgical reform resulting from Vatican II were a continuation of the developments of previous centuries, including the Council of Trent. Also in the reign of Pius XII, he was appointed Professor in the Pontifical Institute of Sacred Music in 1955, Consultor to the Sacred Congregation of Rites in 1956, and Professor of Sacred Liturgy in the Lateran University in 1957.